Hello! My name is Zara and I run Tatty Bumpkin in Brighton, Hove & Lewes. 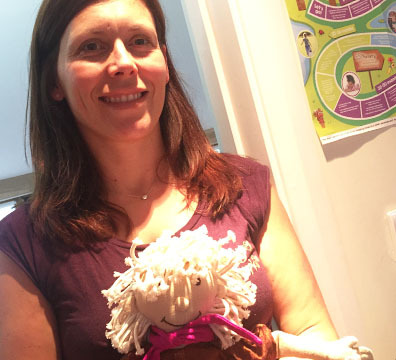 I’ve been a fan of Tatty Bumpkin ever since my daughter was offered classes through her nursery – she loved it! After working for a large corporate company for 20 years I was given the opportunity for a career change and jumped at the chance to take over the Brighton Tatty Bumpkin business. Our Tatty Bumpkin training is CACHE accredited (Council for Awards in children’s Care, Health and Education) and all teachers hold a current Disclosure and Barring Service (DBS) certificate, are trained in paediatric emergency first aid and are fully insured. We are currently running classes in local Nurseries and are launching our public classes which are starting on Monday 20th February 2017. If your school. nursery or playgroup is holding an event this year, for example; an autumn fete, please let us know. We’d love the opportunity to run a Tatty session or create a Tatty Bumpkin stall. Please email me for more information. If you would like your child to participate in Tatty classes in their school, pre-school or nursery setting, please contact us. SCHOOLS – Did you know we can deliver classes to cover PPA Cover, Healthy Schools, School clubs and SEN? For more details please click here and contact me for availability. I contacted Tatty Bumpkin when trying to organise my daughter's 3rd birthday party and found them to have a fantastic and positive attitude, they also went above and beyond what I expected in relation to helping organise the day. By helping source and check out locations an even helping with the decorations, they made what could have been a stressful day, wonderful and memorable. Emma and Ian were very warm and smiley and really engaged the kids, despite there being a mix of ages, the kids were mesmerised! The activities were really engaging and creative; the day had a really calming effect on the children. The feedback I had from the kids and the parents was all positive with some even saying they had never been to such a fun party! From booking our party through to the actual day, Emma and I were in constant contact with offers of classes and including a face to face meeting to discuss the wonderful ideas she had to offer to suit Edison's favourite things! The party was amazing and captured a whole range of age groups. Edison was made to feel EXTRA special for his birthday and all of the children invited had fun helping solve the Tatty Bumpkin mystery. Emma totally captivated the children for a whole 90 minutes. Brilliant, amazing, imaginative fun!! Tatty Bumpkin parties are a real special occasion and if you are looking for something totally different then you will find it here. Emma is totally passionate about ensuring children have a wonderful and happy time. Thank you again for such a fantastic afternoon, all my friends are still talking about how wonderful it was!! !